Ancash is the department in which Huaráz is located and of which it is the capital. The region, of course, is known for its snowcapped peaks and beautiful landscapes. 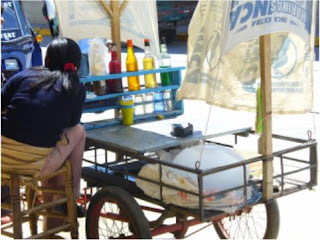 While it is not known as a region of great cuisine -unlike, say, Arequipa or the north coast- it is known as a source for some quality foodstuffs which people will go out of their way to acquire from there. One example which, logically, can only be obtained locally, is snowcones made from glacial ice brought down from the mountains. 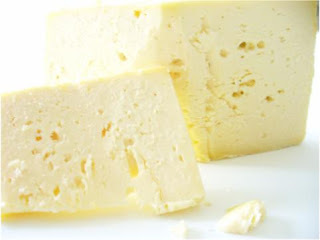 Though not as esteemed as Cajarmarca in this regard, Ancash definitely holds its own as a dairy producing region. Along the roads in the region, every little town has stalls offering cheese for sale, and the market in Huaráz is filled with stalls offering cheeses. The varieties don't seem as numerous or as diverse as those that come from Cajamarca or Junín where more modern methods and cultures have been adopted for large-scale production to be sent throughout the country. These, on the other hand, are artisanal cheeses, made on a small scale, not always pasteurized, and generally sold only locally. They taste great with bread and avocado, or in the classic Peruvian pairing, with some fresh mountain-grown corn on the cob. Manjar blanco (lit. "white delicacy") is somewhat misunderstood item. 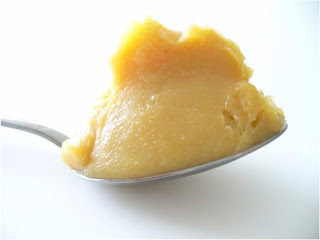 In Lima and elsewhere one finds carmelly, brown substances calling themselves "manjar blanco", often made from boiling and carmelizing sweetened condensed milk. They're fine, and taste good in pastries, but they're a poor approximation. 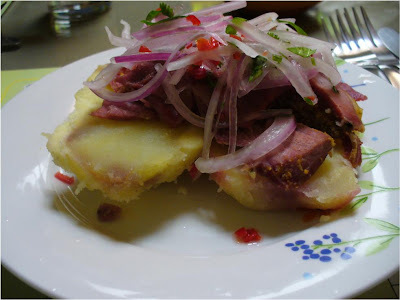 Another food that Ancash is justly famous for is its jamón huaracino, or Huaráz ham. Whole legs of pork are salted and rubbed with spices and hung to dry, and the result is delicious. It is not unusual for travellers, much like ourselves, to return from trips to Ancash with a whole ham or two stashed in their luggage -again, much like ourselves. The ham is often served boiled with tubers and root vegetables, although it is also often baked or cooked in slices on the stove top and served with potatoes and salsa criolla, as at Señor Cuy.